This past week, I had the chance to do a day of guiding in foothill rainforests on the other side of the mountains. I love these rich habitats for their mossy, over-vegetated forests, tall canopies, and resultant rich avifauna. At the same time, this special habitat can be an easy generator of frustration because it’s so damn hard to see birds in such an impressively tangled overgrowth of greenery. Throw in lots of cool, rare birds into the mix and we end up with a perfect blend of birding madness- a place that harbors many serious targets, you know they are somewhere out there, you have no idea when that ground-cuckoo or Black-crowned Antpitta might pop out and say “hello”, but it might also rain at any given moment. Yeah, unreliable in terms of which species you might see, but reliable in always giving you a unique, high quality birding experience in a forest jam-packed with life. The air smells fantastic, it can be as humid as a bathroom after a long shower, and it’s one of the places where you can watch the antics of Band-backed Wrens. 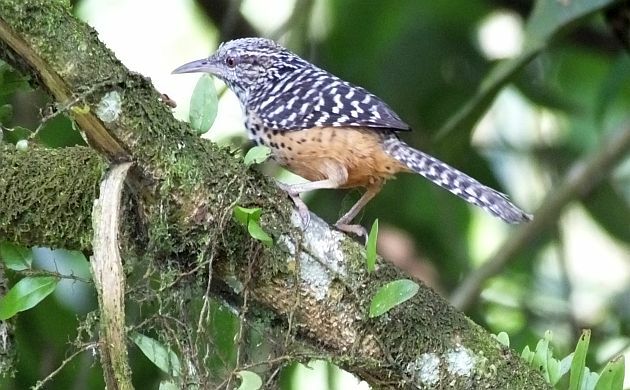 A boldly-patterned, babbler-like bird species. The Band-backed Wren ain’t no dainty little scolding thing that builds nests in hanging boots. This is a long-tailed, biggish thing that creeps around vine tangles and other tropical, mossy stuff, often up there, just below the canopy. It can live in primary forest and seems to also occur in semi-open areas as long as trees with a dense, vegetated canopy are present. A few days ago, I was happily surprised to see a pair doing their creeping thing on a tree right at eye level. They checked out the forks of trees. 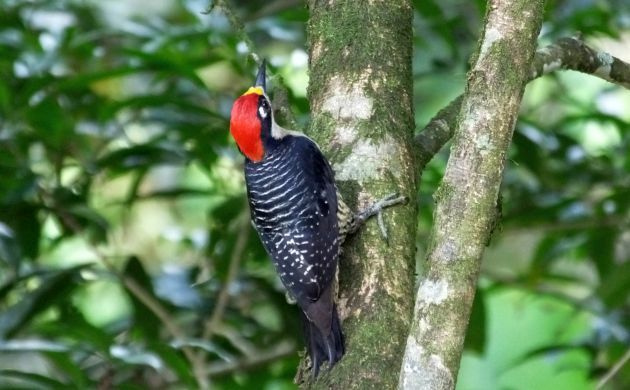 They morphed into Black-cheeked Woodpeckers. Not really, but every post about birds in Costa Rica should have at least one picture of a colorful bird. I can at least say that this woodpecker foraged on the same tree as the wrens. Back to the real, Band-backed deal. 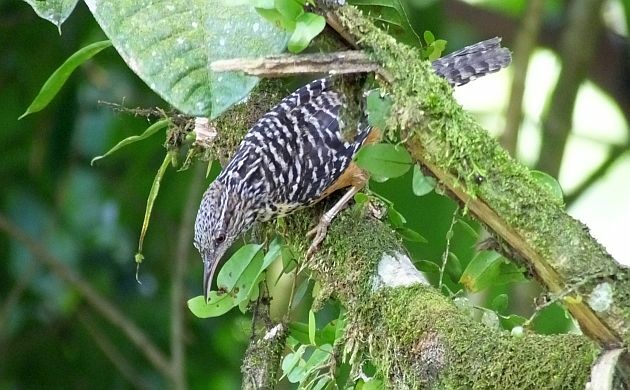 These large wrens share their equally lengthy genus name Campylorhynchus with 13 or 15 other species (depending on if you accept the IOC take on the Rufous-naped Wren although since that split seems to be pretty solid, we can expect an eventual change on the AOU list as well). I wouldn’t also be surprised if Campylorhynchus is split into two genera; one clade with rollicking, musical notes, and another with dry scolding notes. 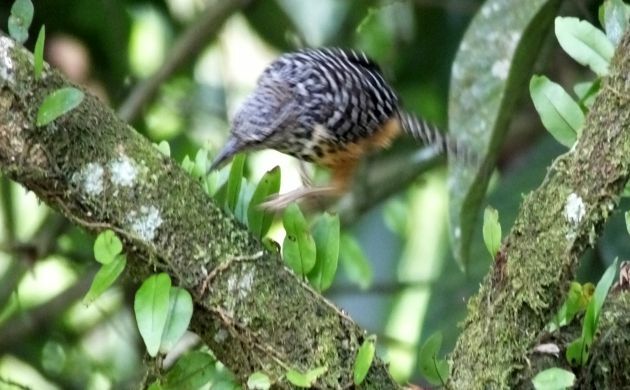 The Band-backed Wren falls into the latter category. 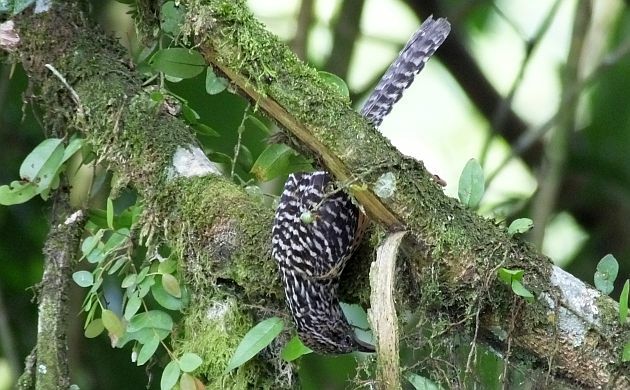 During the 90s, an encounter with this species in Costa Rica wouldn’t have been a surprise at all. In fact, I would have expected seeing and hearing these busy birds on any day of birding the Caribbean slope. But, since then, something has been happening that has reduced their numbers. At least, I detect them far less than I used to. The habitat itself hasn’t really changed in terms of extension nor obvious structure (we actually have more forest now), so the root of the problem should lie elsewhere. A warmer, less humid climate probably has something to do with it. 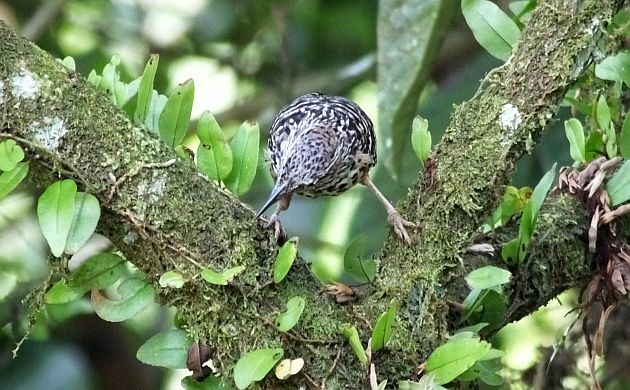 Neither is it probably a coincidence that other insectivores that occupy the same habitat and also forage by picking arthropods off of branches and trunks have also declined (think woodcreepers and Stripe-breasted Wren). Decline in abundance of arthropods correlated with less precipitation and subsequent decline in insectivores in Costa Rica? Yeah, probably. Looking for a research project? You might to try this one.